The victims were fatally shot "execution style," authorities said in 2016. Ohio authorities have made four arrests in connection with the murder of eight family members who were fatally shot "execution style" in 2016. 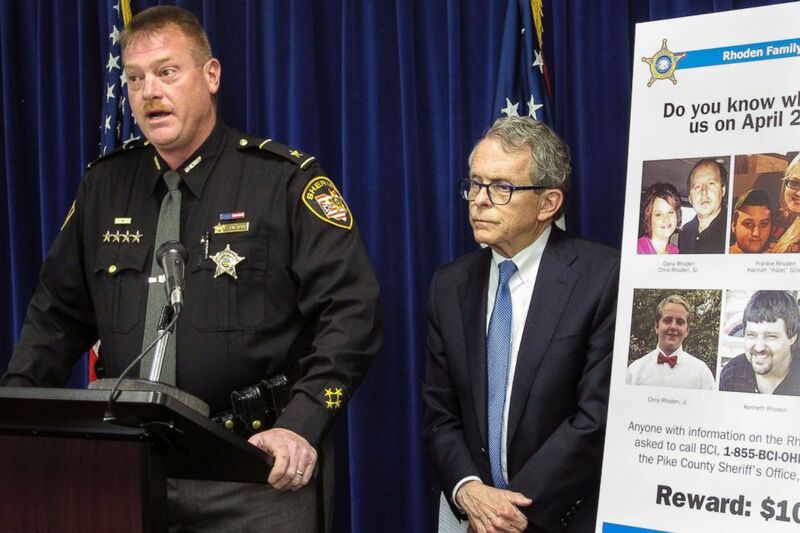 All four arrested belong to the same family from South Webster, Ohio, and were charged "with planning and carrying out the murders," Ohio Attorney General Mike DeWine announced in a press release. The suspects were identified as George "Billy" Wagner III, 47; Angela Wagner, 48; George Wagner IV, 27; and Edward "Jake" Wagner, 26. They were taken into custody Tuesday afternoon, and are characterized as a husband, wife and their two sons, DeWine said. (Ohio Attorney General) Four members of the same family have been arrested in connection with the murder of eight people in 2016: George "Billy" Wagner III, 47; Angela Wagner, 48; George Wagner IV, 27; and Edward "Jake" Wagner, 26. Each is charged with eight counts of aggravated murder with death penalty specifications, DeWine told reporters. It's unclear whether the suspects had retained defense attorneys. The victims who were killed were Christopher Rhoden Sr., 40; his ex-wife Dana Manley Rhoden, 37; their three children, Hanna May Rhoden, 19; Christopher Rhoden Jr., 16; and Clarence "Frankie" Rhoden, 20. Frankie Rhoden's finacee, Hanna "Hazel Gilley," 20, was also killed, along with the brother and cousin of Christopher Rhoden Sr., Kenneth Rhoden, 44, and Gary Rhoden, 38, respectively. Seven of the family members were discovered dead on April 22, 2016, in three separate homes along the same road in Peebles, a small village about 70 miles east of Cincinnati, while the eighth victim was found nearby in Piketon, according to officials. Many appeared to have been shot in their sleep, and one of the women was found lying in bed with a 4-day-old baby. "All eight victims were killed in cold blood," DeWine said. "They were shot in their own homes. They were brutally and viciously executed." The 4-day-old was one of three children, along with a 6-month old and a 3-year-old, who were found unharmed at the three crime scenes, police said. 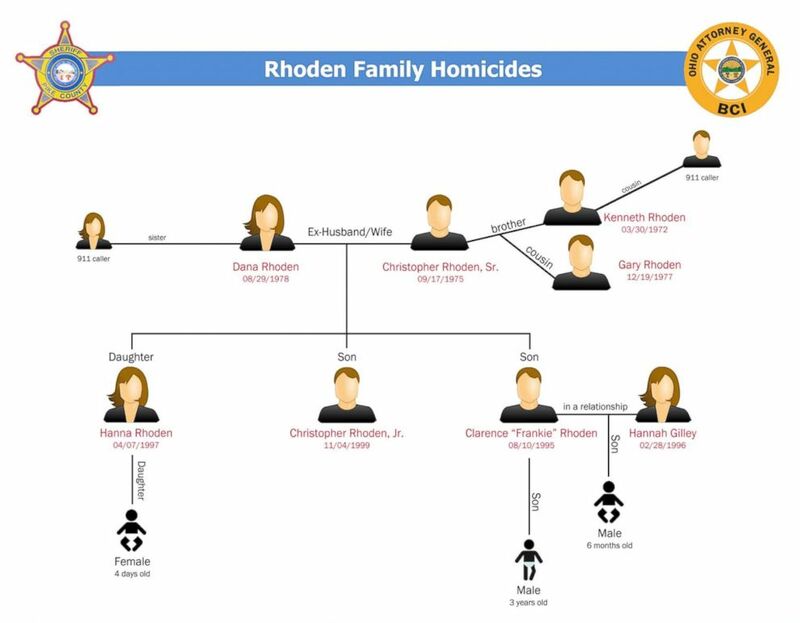 (Ohio Attorney General/Pike County Sheriff) Ohio Attorney General Mike DeWine and Pike County Sheriff Charles Reader released a chart that describes the familial relationships of the victims who were killed in Pike County, Ohio, on April 22, 2016. DeWine accused the Wagners of spending months carefully planning the murder of the victims, who he characterized as friends of theirs. The Wagners "studied the victims' habits and routines. They knew the layouts of their homes. They knew where they slept," DeWine said. "The killers knew the territory and meticulously planned these horrendous murders," DeWine said. The suspects allegedly purchased ammunition, a magazine clip, brass catchers and a bug detector in preparation for the crimes, authorities said. Pike County Sheriff Charles Reader described the crime scenes as something he'll never be able to un-see. "Images of the houses, the bodies, the scenes, I can never erase them," he told reporters Tuesday. "Even 20 years of law enforcement experience cannot prepare you fully for a day like that." 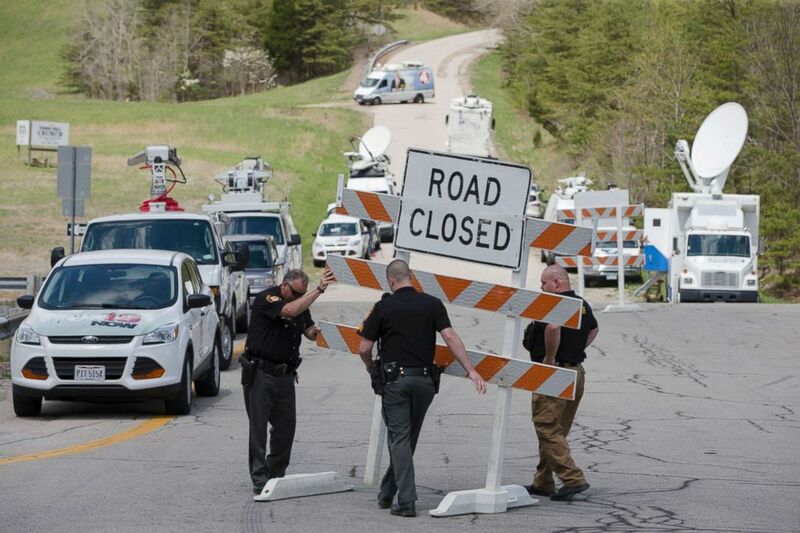 (John Minchillo/AP Photo, FILE) Authorities set up road blocks at the intersection of Union Hill Road and Route 32 at the perimeter of a crime scene, April 22, 2016, in Pike County, Ohio. The Wagners allegedly tampered with evidence after the murders were carried out, including cameras, a silencer, shell casings, parts of a home security system and the victims' cellphones, DeWine said. They face additional charges, including, conspiracy, engaging in a pattern of corrupt activity, tampering with evidence, unlawful possession of a dangerous ordinance, aggravated burglary for allegedly breaking into the homes to carry out the murders, unauthorized use of property, obstruction of justice, interception of wire, oral or electronic communications and forgery for allegedly forging child custody documents, DeWine said. While DeWine did not discuss the motive of the murders, he said the custody of a young child "plays a role in this case." "They did this quickly, coldy, calmly and very carefully, but not carefully enough," Reader said. 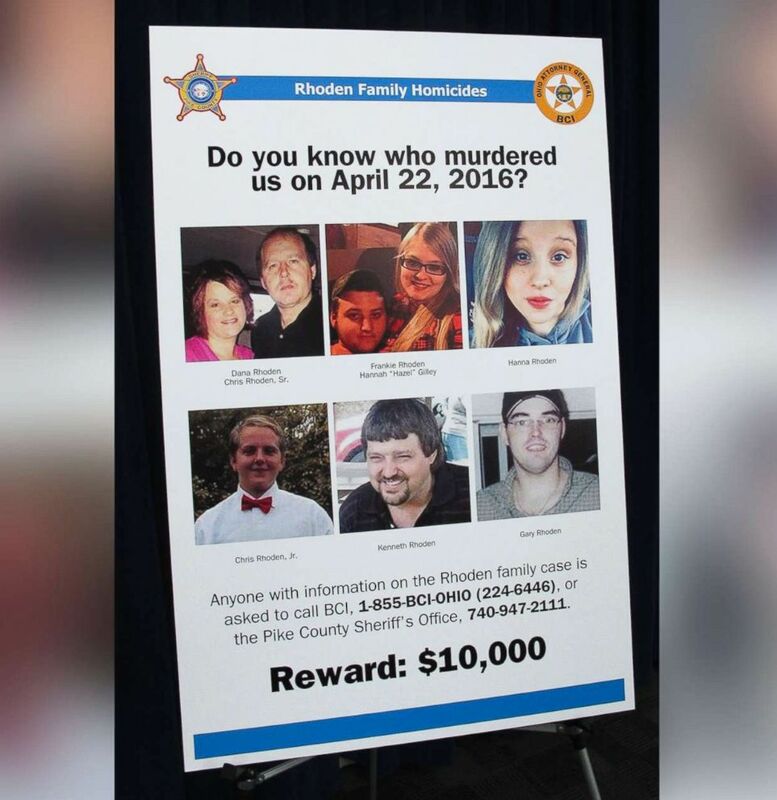 (Andrew Welsh-Huggins/AP) A poster asking for information about the 2016 unsolved killings of eight family members in southern Ohio, is displayed at the Ohio Attorney General's Office during a press conference, April 13, 2017, in Columbus Ohio. Jake Wagner is also charged with unlawful sexual conduct with a minor for allegedly having sexual contact with Hanna May Rhoden when she was 15 years old and he was 20 years old, DeWine said. Jake Wagner is the father of Hanna May Rhoden's older daughter, who was staying with the Wagners on the night the homicides took place, DeWine said. The mothers of both Angela Wagner and Billy Wagner, Rita Newcomb, 65, and Fredericka Wagner, 76, respectively, are also facing felony charges of obstructing justice and perjury for allegedly misleading authorities over the course of the investigation, DeWine said. Newcomb is also charged with forgery. All of the suspects were arrested without incident, Reader said. Billy Wagner was arrested in Kentucky, while Angela was arrested at her home, he said. Their two sons were arrested during a traffic stop, while their mothers were arrested at their homes as well. The family members are currently being housed in separate facilities, Reader said. Authorities had enough to charge the Wagners after discovering "the last piece of significant physical evidence" on Oct. 30 and completed an examination of the evidence on Nov. 7, DeWine said. The indictments were filed after authorities "confirmed the existence of a homemade firearm suppressor believed to have been built by the suspects," DeWine said. DeWine described the newest evidence as the final piece of a "thousand-piece puzzle," adding that he believes the killers have been caught and that no one else was involved in the murders. (Andrew Welsh-Huggins/AP, FILE) Pike County Sheriff Charles Reader, left, discusses the ongoing investigation into the unsolved killings of eight family members in southern Ohio in 2016, at a news conference attended by Attorney General Mike DeWine, right, whose office is leading the investigation, April 13, 2017, in Columbus, Ohio. Since the murders, investigators have followed up on more than 1,100 tips, conducted 550 interviews, tested more than 700 pieces of evidence and served more than 200 subpoenas, search warrants and court orders, DeWine said. 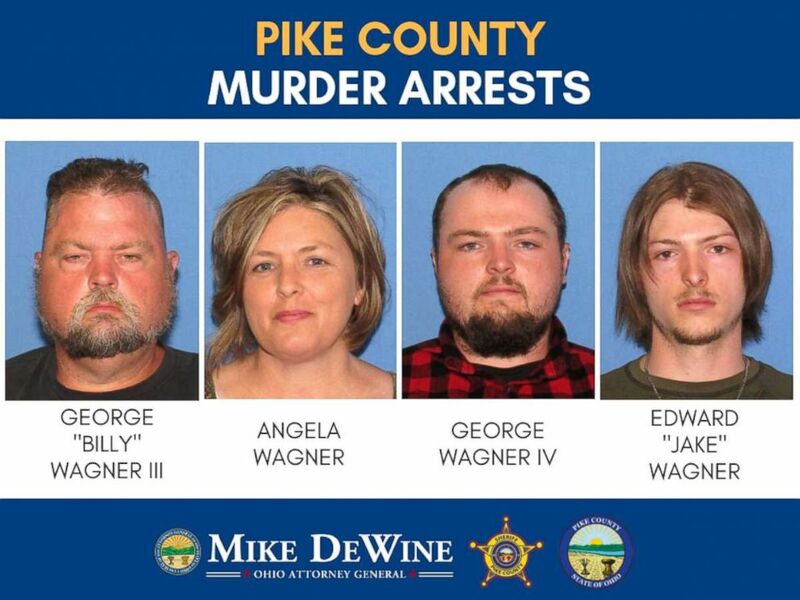 Investigators also traveled "thousands of miles to 10 separate states," including Alaska, where the Wagner family had moved before coming back to Pike County last spring, DeWine said. Some of the crime scenes had "marijuana commercial grow operations," DeWine, who is now the governor-elect, said last year. The case featured an "undercurrent of drugs," but drugs were not necessarily the motive, DeWine said. ABC News' Rachel Katz, Emily Shapiro and Jason Volack contributed to this report.